Counsel for the parties named in Court Order 1201-00816 (January 27, 2012) will appear in Chambers at the Calgary Court Centre on Friday, February 3, 2012 to appeal the Court Order. Our counsel feels there are numerous issues relating to both the substance and the process of the Court Order. We are asking SRD to instruct SLS to stand down and not to begin any logging until the appeals are heard. If the logging were to begin, and if we were successful on appeal, we would also seek penalties for any damage the logging caused. Around 3:30 pm today, SRD officers arrived with a Court Order directing us to cease and desist our actions. RCMP Inspector McGeough was also on site and, using his discretion, gave us until Wednesday morning at 8 am to discuss the matter with our lawyer. After that time, the RCMP will begin enforcing the order. We have contacted our lawyer, and will consult with him tomorrow. The logging operation is not to be started tomorrow, but some protestors do plan to be there to continue to make passersby aware of the situation. There is some video of today’s events at http://www.youtube.com/watch?v=RdugF-LL6eg&feature=youtube_gdata. Not too much new over the weekend. We had plenty of protestors today (Sunday), and lots of people waving, giving a thumbs up, and honking their horns. Protestors will be out at the site again tomorrow. We’ll see what the morrow brings. Please join us at the protest site if you can. Protestors were out again today. People stopped to chat, to take photos, and to leave some goodies behind. We’re hoping for a good turnout at the protest site tomorrow (Sunday, January 29). 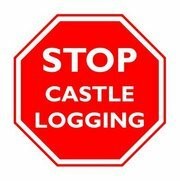 Please come and show your opposition to clear cutting in the Castle. Bring a sign. Please note there are no facilities of any kind. We had expected a visit from SRD and the RCMP, but things were quiet at the protest site today except for the visit from RCMP Inspector McGeough from Lethbridge. Not sure what that means. We’ll be out at the protest site again tomorrow (Saturday) and Sunday. Come and join us if you can. Bring a sign. It was quiet at the protest site today. Neither the RCMP nor SRD visited. We did however, have a visit from a CTV news crew, and from “Protests r Us” catering service. The camp is still up, and protestors spent the day holding signs and waving at the passing vehicles. As usual, the number of waves, honks, and thumbs up vastly outnumbered any negative reactions. We’ll be back at the site tomorrow. Given how eerily quiet it was today, we’re wondering if something might be up for tomorrow. Tomorrow’s weather looks pretty good. Please come out and join us if you can. Late this afternoon, a large number of SRD officials, Spray Lake Sawmills personnel and contractors, and two RCMP officers along with the regional staff sergeant showed up at the site. A number of our supporters also arrived. The feller-buncher was started up, and we were asked to leave. Five or six people stood in front of the machine and said they won’t move. We were all given an Enforcement Order, and all the officials and the loggers left. We’ve sent the document to our lawyers for an opinion and legal advice.